The turn of the last century and Theodore Stubbs' manor house resides in the quirky village of Muchmarsh. A renowned entomologist, he is often within the attic adding another exotic specimen to his extensive collection of insects. But Theodore is also a master hypnotist, holding the household in thrall to his every whim. Theodore's daughter-in-law Eleanor returned from the sanatorium two months before is a haunted figure, believing that her stillborn child Alastair lives and hides in the shadows. Then she falls pregnant again, but this time by the hypnotic coercion and wicked ravishment of Theodore. A dreadful act begets terrible secrets, and thirteen years later the boy Alastair Stubb begins to lose his identity. It is not long before mystery, intrigue and murder follow gleefully in his wake. 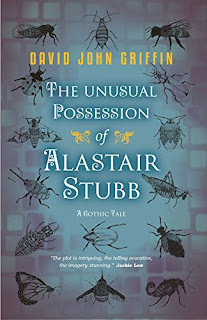 The Unusual Possession of Alastair Stubb is a gothic terror of the highest order, delivering a dream-like and hallucinatory reading experience that promises to reveal secrets both disturbing and astonishing. Do you dare meet the Stubbs? I was drawn to this book by the amazing gothic cover of butterflies, moths and bugs and the amazing font inside further enhances the gothic atmosphere. The Stubbs are indeed a very strange family – when I say strange, I mean stark raving bonkers. I wasn’t sure what was going on or who was who for most of the book, but that’s not to say I didn’t enjoy it. I certainly enjoyed the second part of the book more when Alastair appeared. There’s a murder, or is there? Where is the body? There’s a pregnancy – but who is the father? 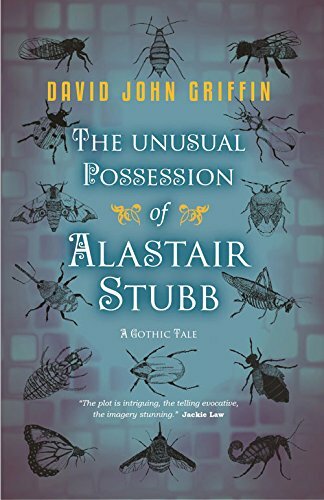 I loved the play on words of the title as Alastair’s possession is two-fold - he is given a most unusual possession by a crazy lady but is also possessed by the spirit of Theodore. There are also some splendidly named characters in the book that added to the craziness, my favourite being Mr Fishcake. This book really reminded me of a Tim Burton film; it’s dark and wacky but it’s not everybody’s cup of tea. Unusual, quirky and a little bit wacky, it’s a book to read beside the fire on a cold winter’s night with a little glass of port and then let your imagination run away with the Stubbs.